The Tallet Barn in Marhamchurch, near Bude, Cornwall sleeps 4 people. 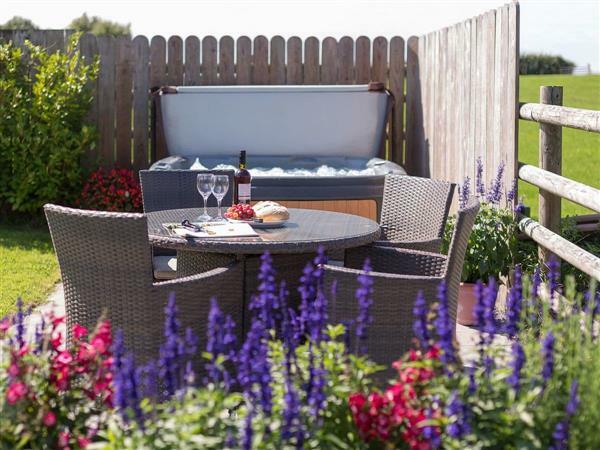 The Tallet Barn near Bude with its private hot tub is the perfect choice for a family holiday or countryside escape at any time of the year. The cottage is peacefully located in a small courtyard of cottages in an Area of Outstanding Natural Beauty, close to the breathtaking North Cornish Coast. This delightful, detached, holiday cottage has a private driveway and garden to relax in and enjoy the country views whilst you plan your day. Set in 50-acres of private land which guests are welcome to explore, it is perfect for nature lovers, with superb walks around the woodland and lakes, all accessible direct from the property. The Tallet Barn is tucked away to enjoy maximum seclusion, whilst offering an excellent base for touring both Devon and Cornwall. It is just 4 miles from the wide golden sands of Widemouth Bay, famous for its excellent surfing and many rock pools. Bude, 4 miles, has three more lovely sandy beaches and a good selection of shops and restaurants, many specialising in locally caught sea food. It also benefits from a golf course, tennis court, horse riding, indoor ‘Splash’ pool, surf schools and bowling. This is an ideal location with something for everyone. The picturesque fishing villages of Tintagel, Rock and Padstow are close by and the wild beauty of Dartmoor and Bodmin Moor are all within easy driving distance, as is the famous Eden Project. Take part in water sports on Tamar and Roadford Lakes enjoy coastal walks and breathtaking clifftop views take a Segway tour of the coastal path or a boat trip on Bude Canal. For family fun, the Big Sheep and Milky Way Adventure Parks are not to be missed. The beach is 4 miles from The Tallet Barn near Bude. With the shop 1½ miles, and the pub and restaurant are 1 mile from The Tallet Barn. Living room: With Freeview TV, DVD player and elm floor. Kitchen/dining room: With electric oven, electric hob, fridge/freezer, dishwasher, washer/dryer and slate floor. Bathroom: With shower over bath, toilet and slate floor. Bedroom 1: With double bed, Freeview TV, Velux window and en-suite toilet. Oil central heating, electricity, bed linen, towels and Wi-Fi included. Travel cot and highchair available on request. Welcome pack. Lawned garden with patio, garden furniture and barbecue. 50-acre natural grounds with woodland (shared with owner and other properties on-site). Hot tub for 4 (private). Private parking for 2 cars. No smoking. Please note: There are 3 steps in the garden. Holidays at The Tallet Barn run from Friday to Friday. For a better idea of where The Tallet Barn is, you can see The Tallet Barn on the map below. The Tallet Barn is in Cornwall; should you be on the lookout for a special offer, you can find all the special offers in Cornwall. It's always worth checking to see what is on offer at the moment. Do you want to holiday near The Tallet Barn (UKC3176), you can see other cottages within 25 miles of The Tallet Barn; have a look to find your perfect holiday location.